Why waste time dropping off and picking up when you can get the same low prices and save all the time and hassle? $10.00 worth of dry cleaning FREE. No strings attached. New Clients Only. 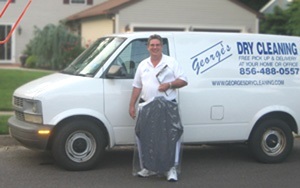 Try our top-quality dry cleaning service and the convenience of door-to-door service without spending a dime. No strings attached. No fine print. No extra purchase required. We will REALLY come to your home to pick up your garments and bring them back for you at no extra charge. You're going to LOVE our service!